You can almost see it now...Rigger getting bigger in an Artifact heavy environment where Arcbound Ravager encourages Artifacts hitting the grave. Now you have multiple creatures benefiting from the act. If Ravager's high price scares you off, try Atog for an Uncommon solution with similar Rigger results. 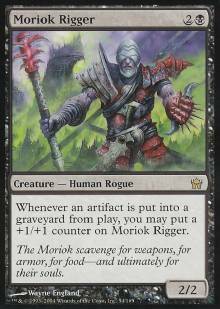 Casual loves creatures that can grow to huge P/T proportions, and Moriok Rigger fits that bill. Look for him to appear in Type 1.tabletop in livingrooms and friends' houses. In limited, he's already a Grey Ogre (a Grey Ogre is described as a 2/2 creature for 3, usually considered a decent casting cost solid creature). So now add its ability that gives it counters as artifacts hit the graveyard, and Rigger becomes excellent in the limited environment. Seems like this would also go in the affinity deck, but this doesn't do anything proactive for the deck. Yes, you get a very large guy to swing with. However, he can just be chump blocked until the cows come home. Disciple of the Vault is infinitely better for all decks. In limited, where you don't have a chioce, this guy may eventually become large enough to do some real damage. I'd consider this guy as around a 6-8th pick. Am I the only one who looked at this card and wondered why Wizards thought the Arcbound Ravager needed a friend? Because, you know, he’s not strong enough on his own, and he already has a certain Disciple friend who is in the Dark Arts. Might as well have a couple more friends to help smash opposing mages to a bloody pulp. While this card costs three, and may or may not really end up fitting in Ravager, and his inability to destroy an artifact on his own weakens him, I still think he will see play, especially in limited. Some people have said that this might have a place in versions of Ravager-Affinity, allowing you to generate a massive, non-artifact creature that can beat down with some help from a Ravager or an Atog. I see that, but I can also see this guy making some sort of appearance in a control-ish black/x deck that spends a fair amount of time destroying or sacrificing artifacts; either way, he’s certainly got some potential in constructed, even though he starts out as a 2/2 for three. At least he’s not total trash. This is just the kind of creature you want to hide behind your land and other permanents at a group game, allowing him to quietly become bigger while you bide your time, waiting for an opportunity to strike. He’s not a whole lot of excitement right away, but he can be a decent surprise to people who just aren’t paying attention. B2 is such a robust cost in Mental already, cast other things ahead of this, unless you have a pretty good follow-up next turn (like Shatterstorm). At the *very* least, he’s serviceable in limited. Grey Ogres aren’t exciting, but they do get the job done. Pair him up with red or green, and you’ve got a pretty solid player; give him a bunch of Spellbombs to play with and some way to put them back into your grip, and you have a veritable monster on your hands. Don’t let this one get by you in draft; I don’t know if he’s always a first pick, but he’s probably real close after that. And we thought that we'd seen everything that Ravager Affinity had to offer. This is one more card that fits right into the mix. It might be more likely to find its way into the deck though is Skullclamp gets banned like popular opinion says it is. Either way, you can definitely expect to see this card played. Limited play is where this card can really shine. I'd early draft this card a lot if I were in black. great addition for blue/black affinity decks. Chapman Moriok Rigger is okay but not amazing. 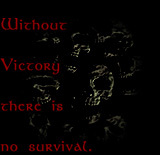 While there is obvious synergy with so the current Skullclamp Affinity builds the bottom line is that the Rigger doesn't provide for the quick wins that a Disciple can provide. He does become a heavy hitter as the game progresses but building up slowly isn't important for a deck that can win fast. Even so, the ability to repeatedly grow is great for any critter.